Visit our booking page to read our booking terms & conditions and complete the booking form. Learn more about World Nomads travel insurance. 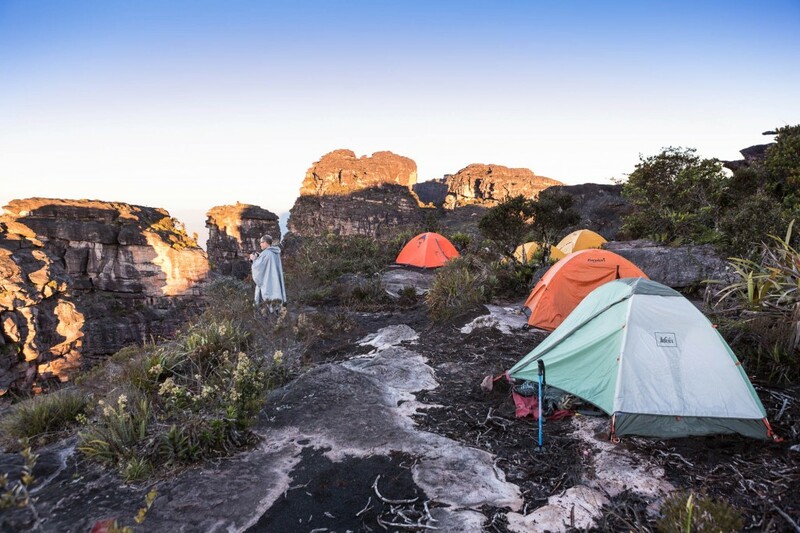 You climb for three days through different levels of the tepui across savannas, through rain forests, along mountain paths, with truly spectacular views all around, until finally with a small vertical climb exiting a cave, you reach the summit of the table-top mountain – a moment you will never forget in your life! A feeling of euphoria sweeps over you and tears come to your eyes in happiness. Gaze in awe at the valley far below and the huge rock formations known as El Libertador (the Liberator) in front of your very eyes. Imagine Jimmie Angel, his wife Marie, Gustavo Heny and Miguel Angel Delgado treading these same steps in 1937 after Jimmie crash landed his plane on the tepui. It was the only way down for them and took 15 days to carefully plot the route and make their descent – their supplies included a tent and eighty metres of rope. It’s another world of weird shaped rocks “sculptured” over millions of years by the elements, rivers, canyons, plants, birds and wildlife endemic to the table-top. Indeed Conan Doyle’s Lost World! Spend the next days hiking, trekking, camping and climbing this amazing terrain and marvel at nature’s creation. As part of this Angel-Eco Tours expedition, you hike across savanna, rainforests, across rivers, climb ravines and trek along mountain trails in the middle of Canaima National Park. 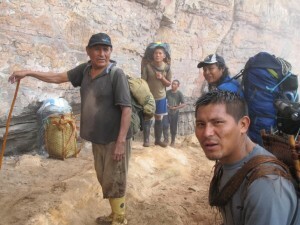 Led by your local Pemón guide and his porters. Two adventures await one for 12 days, the other for 8 days, to and from Uruyén Lodge in the valley of Kamarata below. The 12 day trek will take you all the way to Angel Falls where you can spend the day relaxing and enjoying one of the natural Wonders of the World. The other will take you to the second wall of the tepui where one can only marvel at the scenes below – nature’s creation. If you crave a trekking adventure tour that is out of the ordinary and off the beaten path, Angel Falls and the Canaima National Park are the natural wonders and adventure destinations for you. This trip is moderately strenuous featuring three days of hiking / trekking to the summit of the tepui. The altitude at “El Peñón”, the second camp is a heady 1,600 metres (5,240 ft.) and that is short of the summit which is around 2,300 metres (7,545 ft.). Once on the summit the trekking is fair to moderate. We recommend that trekkers are fit with no health issues and that they bring adequate medical supplies / kits as well as appropriate clothing. We will supply a packing list prior to the trip and a menu. We are looking to set up some serious guidelines, hopefully within the confines of our present tourism partners and friends as well as InParques, who are pretty much in charge of the environment in our National Parks in Venezuela. All climbers / trekkers to obtain and have a viable insurance in case of unforeseen accidents, the location is remote and a good distance from help. For the more serious cases, helicopter assistance may be needed. Group sizes to be limited to a maximum of 6 people – equating to 12 normally with a porter for each climber. There may be the occasional exception but we are seriously looking to contain and work within an environmental “footprint”. Guides to be from the local community or approved by local concensus. Porters to be handpicked amongst the local community. Guides and porters to be proficient in Premier Auxiliary (first aid). It recommended that each person brings a small medical kit, such as bandages, antiseptics, tablets for diarrhea and dehydration. All approved local guides to carry the latest communication tools / methods in case of emergency. Controlled published “dates” for tours, to protect the fragile environment on the mountain and maintain control of rubbish and rival groups in the same camps / locations at the same time. We can and will provide all tents / meals and reserve the right to ask our adventurers to occasionally bring their own supplies or equipment by prior agreement. We are able to provide all transport by land and air, as necessary upon arrival to Venezuela. We are able to book accommodations both in the national park and outside the national park and able to arrange tours to other parts of our beautiful country (see www.angel-ecotours.com). Get inspired – see trip photos! Read a detailed itinerary sample of the 8 day trek to El Dragon. 4 days more required for Angel Falls – itinerary available upon request. Best time is during dry season December through April. Trips are often scheduled and controlled by the local Pemón community due to the fragility of the ecosystems and environment. Best to organize a small group or travel with another. Angel-Eco Tours can advise as to available dates or add you to a waiting list. Prices upon request – minimum two people with a maximum of 6. IMPORTANT - Personal Travel Insurance is a requisite, any personal injury or issue may require a helicopter lift which is extremely expensive. 8 days to El Dragon and the second wall or 12 days to and from Angel Falls to and from Uruyén. Add extra days at front and back of tour for travel time. It will be necessary to at least add one overnight pre and one overnight post trip due to logistics. Uruyén in lodge with beds and shower facilities. Expedition in tents.